Have you ever written an article and wish that someone would actually read it? You start to consider actually improving the quality of the article, but *gasp* that requires hard, honest, work! You want an easy way to become famous on Uncyclopedia! Well guess what? This article is gonna show you how! 2 Okay I Got the Title, Now What? 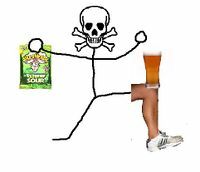 Surprisingly, not very many people are interested in Beer Knee Da Die No Sour. You need a snazzy, stylish, and attractive name for your article! One that will knock the conkers out of anyones socks! But wait. "Let me start an article called Uncyclopedia", you say. It's already taken. "Well how about Chuck Norris?" taken. "Oscar Wilde?" Taken. "Paris Hilton? Hannah Montana? Even Barney the Dinosaur?!?!?" Taken, Taken, Taken. They're all taken, so how can one be original? User BasementDwellingDragonSlayer is an average joe with no writing talent and no work ethic. He longs to be a famous internet celebrity. BasementDwellingDragonSlayer proceeds to click on the search field, turn on caps lock, and bang his head on the keyboard. Users flock to his page wondering what the heck a GHRT?UY;OLK is. Okay I Got the Title, Now What? Step 1- Turn on caps lock. Step 2- You know what to do. "ALDK; SJFQOIWEJ QWEKLRJ QWEOIURASDLKJF. KLA; JDLKFQEWRJ234124 ALJFD/LASLWK AKLDJF LKSJFLASCANT. ASKDLFJASD ASKJDHFKASJHAKHEWKQ, AKJDHQKWEH ALKDJLQKWEJQLJLAJD. ALWEJKLATHISISSTARTINGTOHURTSDJUWORU8QJE ALKJQLWKJERLJALKDSJF AEKRLQWJ TLJE298IHAVENOLIFE3LKQJKLJELW. JKLERJQWLLAJLD." People will read the rest of your article thinking that if they can't read your complex gibberish, that must mean that you have an incredibly extensive vocabulary! They will be terrified to rate it low, in case they look dumb for not having a broad vocabulary range. When they rate it high, guess who gets famous? That's right! YOU DO! CONGRATULATIONS! Hint:This strategy works best if you make lots and lots of pages using this formating. When one must sacrifice quality, one must make up for it in volume. Once you make enough pages, people far and wide will be awed at how you can prevent them from searching anything useful via the search bar. There are these evil people, known as 'moderators' or 'admins' that actually require you to write good content. Following these methods may make the admins delete all of your precious articles, including "L;ASJG'AS" and "AL;'LFDES", or even worse: BAN YOU. That's right, they have control over your very existence on the inter-webs! What are we ever going to do?!?! Fortunately, there's a way around the system. User BasementDwellerDragonSlayer has had his account banned! Oh Noes! He names his new account "BasementDwellerDragonSlayer1". The mods will never know who he is now! He is now free to write articles, such as GHRT?UY;OLK. Laziness triumphs again! Eventually, the mods will complain about having to ban you and delete all your articles. When they complain about you, other people know who you are! When a lot of people know who you are, you become famous. Congratulations! Your mother would be so proud! This page was last edited on 5 July 2012, at 05:57.